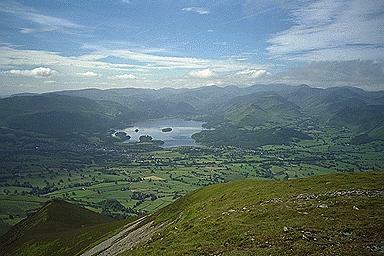 This view is from a point slightly to the east of the summit of Carl Side, where the view of the lowland around Keswick, and the subsidiary peak of Carsleddam - left foreground, are visible, unobstructed by the south ridge, seen here in the right foreground. On the horizon, from the left are: the cleft of Dunmail Raise, Steel Fell - with Bleaberry Fell and High Seat in front, Ullscarf, High Raise, Pike o'Stickle, Swirl How, Grey Friar, Bowfell and Crinkle Crags together, Esk Pike, the gap of Esk Hause, Great End, Scafell Pike and Scafell - with Maiden Moor in front, Great Gable with Dale Head in front, and Kirk Fell. Larger version of this picture.